The main goal of IT service management (ITSM) is to build or improve the relationship between IT, end users, and business leadership in order to achieve business goals. Successful implementation of ITSM may require a new way of thinking along with significant cultural shifts for all stakeholders and the business. The success of IT service management can be measured by how well IT integrates the services they provide with the goals of the business. Finding ways to address IT service delivery challenges, such as the inability to keep pace with customer demand, an overwhelmed team, poor communication, and mediocre service quality, can be difficult given limited budget and resources. IT organizations must correct these inefficiencies while remaining mindful of cost and resource allocations. This white paper will discuss how intelligently integrating the right people, processes, and technology automation solutions can help you overcome these obstacles. 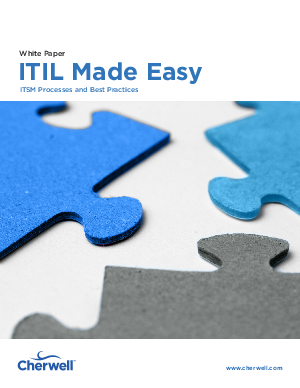 Combining this integration with a tested and proven best practice framework, such as ITIL, enables IT organizations to reduce costs, improve operational efficiency, elevate service quality, and demonstrate the value IT brings to the business.